Even the mention of Photoshop can be daunting because it is such a robust program. Photoshop is amazing, and I suggest learning as much as you can about it, but sometimes we just want to know one or two techniques specifically for lettering and calligraphy. Putting the design over a photo with blending modes is one way of digitizing your hand-lettering that is simple and versatile. I use this technique all the time to spice up my lettering pieces. I will take you step by step from original piece to finished composition, using blend modes, spot healing cleanup, and layering order. Don’t worry if you don’t know what that means. I’ll explain. It’s best to scan your photo at 300 dpi but you can also take a photo of it. If you are going to take a photo, take it in good, indirect sunlight, like by a window. Be very still so the image doesn't come out blurry. 3) If your image needs rotating, go to top navigation bar > Image > Rotate. If you're anything like me, you will need to do this a couple times until you relearn the difference between clockwise and counter-clockwise. 4) Unlock your layer so that you can make edits. If your layer is locked, there will be a lock icon on the right of it in the layers panel. The layers panel is on the right of your screen. To unlock it, click on the lock icon. 5) Create a copy of your original lettering to have a backup. To duplicate the lettering layer left click on the layer > Duplicate Layer or you can click and drag while pressing option (⌥ drag) to make a copy. You always want to have a backup of the original image. This is just good practice. Label the duplicated layer "edits." Label the Copied Layer "Edits"
Make sure to check the preview button so you can see the adjustments. Make the white brighter and the black darker by bringing the outer toggles in towards the middle. If you want to keep the brush stroke feel, you won’t want to make the black too dark, as the details will disappear. 8) Crop your photo to the ratio you want. Press (C) to bring up the crop tool. You can set the ratio in the ratio drop-down on the top bar. I will use 1:1 (square). Drag the corners out to resize the crop area. Re-position by clicking and dragging the image. Press ENTER to set the crop. Click and drag over the marks you want to get rid of. 10) Find a photo that you want to use. I use Unsplash often. Remember to always give credit to the Photographer. Thanks to Steve Carter for the awesome photo! The photo will have an X over it like this when placed. 11) This means that it is editable. You can resize the photo by dragging the corners. Press shift and option (⌥⇧) at the same time as dragging to keep the photo in place and keeping the photo from becoming distorted. Set the image position by pressing ENTER. If you aren't happy with the position or size of the image you can always resize it by clicking on the layer in the layers panel and going to Edit > Free Transform or (⌘T). You can then resize your image and move it. 12) The photo will be the only thing you can see now, so we will have to rearrange the layers. Go to the layers panel. Click on the image layer and drag it under the lettering layer. 13) Set the blending mode to multiply. Click on your lettering layer (the top one). Next to "Opacity" you will see the word "Normal." That is the blend mode. Click on the arrow to the right of "Normal." Click on "Multiply"
As you can see, the multiply mode essentially ignores the white and shows the black. This is why we simplified the image to make the white "disappear." 14) You can keep it like this or you can make the lettering white. 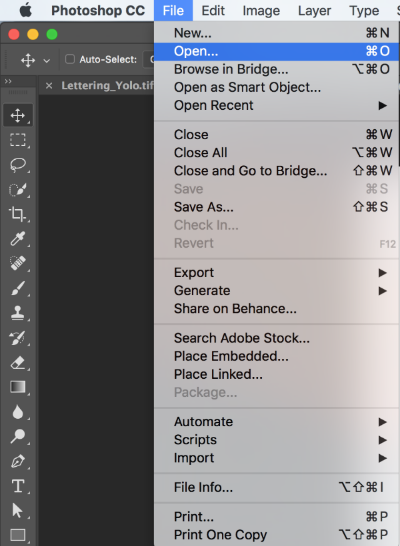 To make your lettering white, set the blending mode to Screen instead of Multiply. Now you can see Screen mode has the opposite effect. It ignores black instead of white. Seeing the image inside of the letters is a cool effect too. 16) If you want the lettering to be brighter, you can copy the layer (⌥ drag) and place on top of the layer to make it brighter and stand out more. I don't like it brighter because it loses the brushpen feel. So I'm going to keep it to one layer on top of the image. I'm going to delete the top layer by clicking on the layer and pressing delete. 17) You can edit the photo to compliment the lettering. Most times you can leave the photo as is. Sometimes, I like to adjust the brightness, contrast, and saturation to make the lettering stand out more. Go to Image > Adjustments >Brightness/Contrast. Bring the brightness down a little, and the contrast up a little to compliment the lettering. You can also play with the saturation by going to Image > Adjustment > Hue/Saturation or (⌘U). This is all up to you how you want the final piece to look. To create this effect, you will need to duplicate the lettering layer. On the second layer, use what we learned to invert the image (⌘I) and set to multiply mode. Keep this layer highlighted, and use the arrow keys to nudge the letters down and to the side or up and to the side so it looks like a drop shadow. In this example I nudged it over to the right and down. To make black letters with a white shadow, put the black letters on the top layer. You can change the opacity of either the white letters or black letters by sliding the opacity scale up or down while the layer is highlighted. Show me what you've made with this tutorial on Instagram or Facebook @noahcampdesign so I can give you feedback. I can't wait to see what you come up with!